A large sheet-like igneous formation in central Australia was once thought to have been emplaced into its host rocks after they lithified, or to have been deposited on the surface as a welded pyroclastic flow. More detailed field work has shown it to have been emplaced into its host sediments while they were unconsolidated and saturated with water. This new synsedimentary interpretation is based on tell-tale characteristics of magma/sediment interaction at the sill margins, including the presence of peperite. Other large igneous bodies have similarly been found to show evidence of significant magma/sediment interaction in a watery environment. These new discoveries provide clear evidence of rapid, large-scale watery catastrophe consistent with a geologic model based on Noah’s Flood from the Bible. One of the strongest mental blocks of the uniformitarian way of thinking relates to the dates that have been assigned to the rocks. In 1993, Jocelyn McPhie of the University of Tasmania published a study on the extensive Tennant Creek porphyry formation surrounding Tennant Creek, a small mining town in central Australia.1 She identified peperite texture at the margins of the porphyry sill where it contacts thick sequences of enclosing sedimentary sandstone and siltstone. Her paper provoked responses in the geological literature,2,3 not challenging her interpretation of peperite, but discussing the problem of how the rock formation could possibly have been emplaced within the sediment. Figure 1. Common places where peperite develops: (a) margins of dikes and other intrusions; (b) margins of partly emergent intrusions; (c) bases of lava flows; (d) margins of invasive lavas (after White, McPhie and Skilling).5 Click image to enlarge. Peperite is not named after the hot seasoning used at the dining table, but after a town in France called Peper, near which characteristic deposits of peperite are described.4 Peperite refers to the rock that forms when hot lava erupts into wet and unconsolidated sediment. This interaction produces a deposit that is neither sedimentary rock nor volcanic rock, but a true mix of the two. As a mixture of sediment and magma, peperite is recognized by its texture. ‘a rock formed essentially in situ by disintegration of magma intruding and mingling with unconsolidated or poorly consolidated, typically wet sediments. The term also refers to similar mixtures generated by the same processes operating at the contacts of lavas and hot pyroclastic flow deposits with such sediments’ [emphasis in original]. As shown in figure 1, peperite forms in association with dikes and other intrusions and at the base of lavas flowing over the surface of wet sediments. Thus, peperite is a genetic term connected to a particular emplacement process. The Tennant Creek porphyry has a very distinctive appearance. The groundmass is a very fine (microcrystalline) dark-greenish matrix, which is filled with abundant, medium (0.5 cm) to large (2 cm), quartz and feldspar crystals.1 There are a number of outcrops of the porphyry in the area around Tennant Creek which give the appearance on a map of a tabular sheet that has been folded and broken apart (figure 2). The folding occurred when the region was extensively disturbed and faulted subsequent to the emplacement of the porphyry and its enclosing sediments. The size of the intrusion is impressive. Outcrops of the sill (figure 2) range from 60 km northwest of Tennant Creek to 40 km southeast, representing a total continuous length of some 100 km. The sheet varies in thickness from tens of metres to a few hundred metres, based on outcrop measurements and the lengths of drill-hole intersections. The width of the sheet is unknown because it is bounded by extensive faulting. McPhie suggests the volume could have been as much as 10 km3 (equivalent to a sheet width of about 1 km). Given a length of 100 km, it is likely that the sill was much wider than 1 km, and the volume of magma may have been as much as 100 km3. Figure 2. Geographical distribution of Tennant Creek porphyry (after McPhie).1 Click image to enlarge. For years geologists have been perplexed by some of the textures observed in the rock outcrops. These have made it difficult to explain the origin of the rock and how the formation was emplaced. One early explanation was that the porphyry was derived from the sediment itself, by low temperature recrystallization and collecting together of gelatinous colloidal components.1 This explanation invokes a most unusual process, to say the least, does not really address the peculiar textures, and does not account for the tabular sheet structure. A later suggestion invoked the standard sill explanation that the porphyry formed from a crystal-rich magma that intruded the solid sedimentary rock.1 The magma would have intruded after the sediments had hardened, while the strata were still horizontal and before they were deformed. Again, this explanation does not really account for the unusual textures at the margins of the sill. Another interpretation was that the porphyry was deposited on the ground surface by the explosive eruption of a crystal-rich magma. In other words, it represents an air-borne pyroclastic flow deposit, which later welded into a crystal tuff.1 Once more, this explanation does not really account for the textures. When viewed on a geological map, it is clear that the porphyry sheet is conformable (parallel) with the strata of the enclosing sediments, the Warramunga Group. However, at closer range, when observed in outcrop, the contact between the porphyry and the sediment is highly irregular. At the upper contact there is an intricate penetration of the porphyry upwards into the overlying sedimentary host rocks and of the sediment downwards into the porphyry (figure 3). Figure 3. Diagram illustrating the processes involved in peperite formation at the sill margins. The important processes for the Tennant Creek porphyry appear to be a tearing of the magma into fluid-shaped clasts and quench fragmentation (from McPhie).1 Click image to enlarge. The intimate mixing of the two kinds of rock can be observed at a very fine scale. For example, wisps of sandstone only centimetres long are distributed irregularly in the porphyry and similar-sized quartz and feldspar crystals, edged with fine groundmass (from the porphyry), are ‘floating’ in the sandstone matrix. In fact, it is common for the clasts of each rock type to have a fluidal shape, suggesting that they were incorporated while they were still soft and fluid. Not only that, but close to the margin, the bedding in the fine sandstone and siltstone is rarely recognizable because it is so disturbed. To the eye, the porphyry in the mixed zone at the contact looks the same as that within the massive interior of the formation. But, the sedimentary rocks at the contact have been significantly hardened as a result of heating by the porphyry and break with a conchoidal fracture, like glass. The induration of these sediments has meant that the outcrops of Tennant Creek porphyry have resisted erosion and now stand prominently in the landscape. All these textures convinced Jocelyn McPhie that the Tennant Creek porphyry was emplaced within the sediments while they were still unconsolidated and still filled with water. She was not able to determine the thickness of the sediments when the porphyry was emplaced, but she suggested that they were of the order of 100s of metres thick at the time. Thus, there was a large geographical area filled with extremely loose, water-filled and unconsolidated sediments. The sediments were rapidly intruded by a huge volume of molten rock that spread out over a vast area within the sediment, forming peperite at its margins as it flowed. The large phenocrysts do not imply that the magma was cooling for a long period of time before being intruded into the sediment. Large crystals can grow very fast, depending on the relative rates of nucleation and growth.8 The magma must have intruded the region very quickly, otherwise it would have quenched and solidified and ceased to flow. There is no evidence for the formation of a significant skin at the flow contacts (i.e. like a lava tube), consistent with the concept of an extremely rapid emplacement. If the intrusion had been advancing slowly enough for a skin to form, the contact would have been more regular and would not have formed peperite. It does not appear that the intrusions were explosive or that fragmentation was caused by expansion of steam, which suggests the pressure due to the overlying water and sediment was great enough to inhibit steam generation. There was plenty of water to remove the heat so that the whole intrusion was cooled rapidly and the groundmass formed a microcrystalline texture—a coherent glass. The evidence speaks of widespread and rapid sedimentation, voluminous and rapid magma generation, and rapid magma transport—all associated with large volumes of water and all occurring faster than the time needed for sediment to settle and dewater. It does not take much imagination to see that these processes are entirely consistent with a catastrophic geological Flood model based on the biblical account. One obstacle to linking these deposits to Noah’s Flood is a mental one erected by a prior conditioning against viewing the evidence outside of the uniformitarian paradigm. One of the strongest mental blocks of the uniformitarian way of thinking is connected to the dates that have been assigned to the rocks. In this instance, the Warramunga Group sediments which enclose the porphyry are classified as Early Proterozoic and believed to be about 1.8 Ga old. This number was calculated from U-Pb measurements on zircons from a volcanic formation near the base of the group. However, as discussed above, the field evidence associated with the Tennant Creek porphyry points to a watery catastrophic environment. The field evidence for the enclosing sediments also points to very rapid deposition. For example, most of the Warramunga Group, which is as much as 6,000 m thick, comprises graded beds of sandstone and greywacke, interbedded with shale. These are typical of sediments deposited rapidly as turbidites—that is of sediments spread over huge areas in a submarine environment as a result of underwater avalanches. Such processes do not take much time. Thus, even though the field evidence points to large-scale catastrophic deposition, radioactive dating can act as a mind-forged manacle and prevent the evidence being consistently interpreted. A recent study on the uranium, lead and helium within zircon crystals from the Jemez Granodiorite, New Mexico, USA, highlights the inconsistency of these billion-year dates. Uniformitarian geologists assigned a date of 1.5 Ga (Precambrian) to this granodiorite, but the zircon crystals still contained excess quantities of helium. This indicated that a period of rapid radioactive decay had occurred in the not-too-distant past.9 If the zircons really were multi millions of years old, the helium should have diffused out of the zircons long ago. Instead of indicating the true age of the rocks, it seems that the zircons inherited their isotopic ratios, which are being wrongly interpreted as billion-year ages. A similar period of rapid decay could explain the interpreted age of the Tennant Creek porphyry within a young-earth Flood model. The Tennant Creek porphyry is not an isolated example. In the subsequent discussion of McPhie’s paper,10 Trendall describes a spectacular case—the Woongarra Rhyolite in the Hamersley Basin, Western Australia. This was previously thought to be an extrusive (surface) formation, but Trendall found extensive development of peperite, indicating synsedimentary emplacement. He suggested that it was injected beneath some 400 m of soft sediment. The dimensions of the igneous formation are impressive. It has a strike length of 500 km and an average thickness of about 400 m. The total volume is estimated at some 15,000 km3—one thousand times greater than the volume described by McPhie. It is informative to compare this with the volume of ejecta from historic eruptions such as Vesuvius (AD 79) 3 km3, Krakatoa (1883) 18 km3, and Mt St Helens (1980) 1 km3. From a uniformitarian perspective, it is difficult to imagine what sort of modern environment could produce the large-scale magma/sediment interactions to form large-scale peperite deposits. Some have suggested that they form in an island arc setting (where we find lots of water, lots of sedimentation and lots of volcanic activity). However, peperite is also observed within the Columbia River Basalts,14,15 which did not form in an island arc but a continental environment. In fact, such large-scale peperites are not seen forming today. There are no modern-day examples of interactions of enormous deposits of extremely loose, unconsolidated sediment with huge volumes of magma. Peperites are one more example of evidence that points to large-scale watery catastrophe in the geological record, which is consistent with the biblical Flood. McPhie, J., The Tennant Creek porphyry revisited: a synsedimentary sill with peperite margins, Early Proterozoic, Northern Territory, Australian J. Earth Sciences 40:545–558, 1993. Return to text. Trendall, A.F., Frances, E.H. and McPhie, J., Discussion and reply: the Tennant Creek porphyry revisited: a synsedimentary sill with peperite margins, Early Proterozoic, Northern Territory, Australian J. 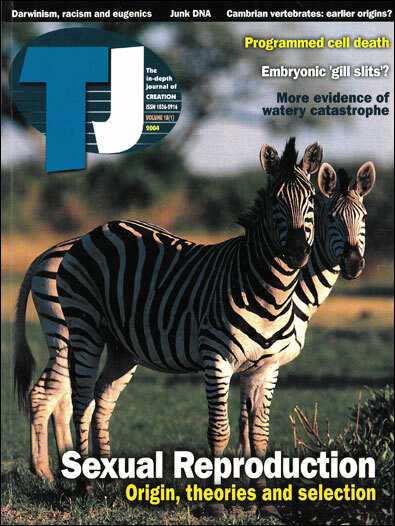 Earth Sciences 41:391–394, 1994. Return to text. Kerr, R.C. and Lister, J.R., The lateral intrusion of silicic magmas into unconsolidated sediments: the Tennant Creek porphyry revisited, Australian J. 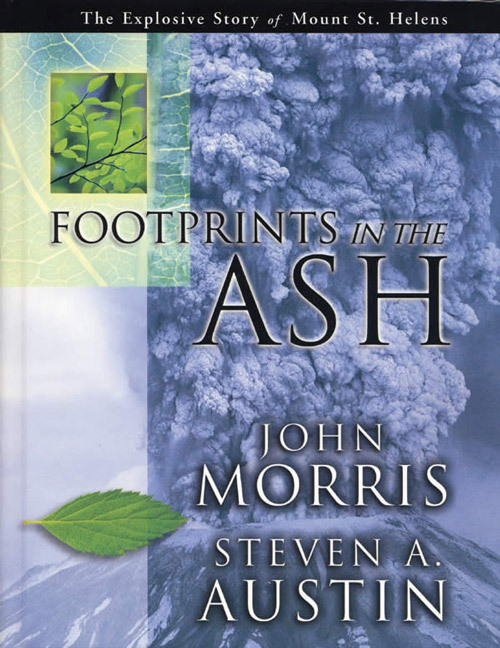 Earth Sciences 42:223–224, 1995. Return to text. Volcaniclastic sedimentation, <www.bowdoin.edu/dept/geology/geo220lectures/lec32.html>, 30 June 2000. Return to text. White, J.D.L., McPhie, J. and Skilling, I., Peperite: a useful genetic term, Bulletin of Volcanology 62:65–66, 2000. Also described on <www.otago.ac.nz/geology/staff/jdlw/peperite.htm>, 19 September 2003. Return to text. McPhie, ref. 1, p. 549. Return to text. McPhie, ref. 2, p. 393. Return to text. Walker, T.B., Granite grain size, not a problem for rapid cooling of plutons, Journal of Creation 17(2):49–55, 2003. Return to text. Humphreys, D.R., Austin, S.A., Baumgardner, J.R. and Snelling, A.A., Helium diffusion rates support accelerated nuclear decay, in: Ivey, R.L. Jr (Ed. ), Proceedings of the Fifth International Conference on Creationism, Creation Science Fellowship, Pittsburgh, pp. 175–196, 2003. Return to text. Trendall, ref. 2, p. 391. Return to text. Hanson, R.E. and Wilson, T.J., Large scale rhyolite peperites (Jurassic, southern Chile), J. Volcanology and Geothermal Research 54:247–264, 1993. Return to text. Hanson, R.E. and Hargrove, U.S., Process of magma/wet sediment interaction in a large-scale Jurassic andesitic peperite complex, northern Sierra Nevada, California, Bulletin of Volcanology 60(8):610–626, 1999, <www.link.springer-ny.com/link/service/journals/00445/bibs/9060008/90600610.htm>, 22 September 2003. Return to text. Skilling, I., Eruption of voluminous debris flows (lahars) derived from subsurface peperite mixing: a characteristic style of ‘boiling pot’ volcanism restricted to the initial stages of Karoo-Ferrar volcanism? TGIF Seminar Series, 1999, <www.imina.soest.hawaii.edu/GG/TGIF/tgif_991015.html>, 22 September 2003. Return to text. Swanson, D.A. and Wright, T.L., Guide to geologic field trip between Lewiston, Idaho, and Kimberly, Oregon, emphasizing the Columbia River Basalt Group: in; Johnson D.A. and Donnelly-Nolan, J. (Eds), Guides to some volcanic terranes in Washington, Idaho, Oregon and Northern California, USGS Circular 838, 1981, <www.vulcan.wr.usgs.gov/Volcanoes/WesternUSA/Circular838/SwansonWright/columbia_river_ basalt_group.html>, 22 September 2003. Return to text. Peperite interbed between Columbia River Basalt flows near Asotin, Washington, <www.geology.sdsu.edu/how_volcanoes_work/Thumblinks/peperite_page.html>, 22 September 2003. Return to text. 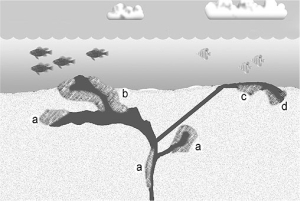 Holt, R.D., Evidence for a Late Cainozoic Flood/post-Flood boundary, Journal of Creation 10(1):128–167, 2003. Return to text.